Used car salesmen have not always received the best reviews, when ratings are given to the various professions in terms of public esteem. Prior to meeting Gerald House, I had no personal experience with either buying or selling used cars, so I could not relate to some of the unkind things or jokes that were said about their profession. My friendship with Gerald changed my attitude about judging someone based on the type of work that he does. Gerald was a natural-born salesman. He never met a stranger, and seemed to be comfortable in every environment- from an executive board room to a sale barn. He owned and operated a well-known used car dealership in my hometown, so he was easy to find when I began shopping for an inexpensive, low-mileage vehicle for our teenaged son. “Come on in, Doc,” he said when I introduced myself and told him my need, “let’s find you just what you need for that boy!” At that point, I knew he would find the right car, or at least make me think he had. The one thing that attracted me to Gerald was his on-going conversation about the things of the Lord. He knew I was a member of a sister Baptist church, but he did not know initially, that I was passionate in my desire to walk by faith, and hungry for Christian fellowship. There was an immediate and eternal bond forged between us, and that bond was Christ. On one Saturday afternoon while at home watching an exciting Razorback football game on TV, the phone rang, and Gerald asked if I “had any more of those pocket Bibles in the glove compartment of your car?” He said he was witnessing to a man, and had run out and needed one. I told him I did, but could I wait until the half-time of the game to bring it? He said, “I guess that’ll be alright.” Over the next few minutes, the Spirit convicted me to leave the football game, and do something much more important. With some grumbling and complaining in my spirit, I drove the 7 or 8 minutes to his lot to deliver the Bible. Upon arrival and prior to parking, I heard the sounds of shouting and laughter inside the office and was not prepared for my next “House experience.” As I opened the door to the office, a very large Black-American had picked up Gerald off the floor and was twirling him around, while shouting and chanting, “Thank you Jesus, thank you Jesus, thank you Jesus!” Gerald seemed to be crying and laughing at the same time, but had the presence of mind to say to James, “There’s Dr. Moore- grab him!” James immediately loosed Gerald, lifted me, and began twirling me with his brawny arms, and shouting to Jesus some more. When Gerald could control himself, he said James had just prayed to receive Christ as his Savior, and was rejoicing “he was sure he was going to heaven someday.” I had learned not to be shocked by anything which occurred at Gerald’s used car lot. My grumbling and complaining had quickly vanished and was replaced with a spirit of thanksgiving, even before James put me down! It was perhaps a year later, I received a phone call from Nell, Gerald’s wife for 35 years. The call was late in the evening on another Saturday, and Nell said these words, “Gerald just died.” Certain she was in on another of his pranks, I said, “Come on Nell, what’s the old boy up to now?” She said, “No, I’m serious, Gerald just drove down to the lot, and when he got there, he slumped over the wheel and his heart must have stopped.” I was in total shock just like Nell. We buried his remains a few days later, but his funeral was not a concession of defeat but a celebration of victory. 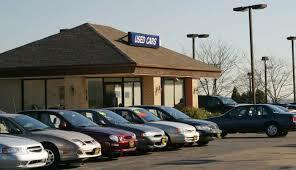 Whenever I drive by that used car lot now, my mind is flooded with many wonderful remembrances of spiritual battles which were fought and won there. In the process of learning, witnessing, laughing and crying at that place, I know my spiritual life enlarged while having the time of my life. I can’t say about the current spiritual condition at that lot, but I can attest to the fact once the Spirit of Christ, embodied in my pal Gerald House, walked and worked at that used car lot. Many souls received Christ as Savior and heaven as their reward right there. It is only fitting on Gerald’s last trip to his lot that evening, he stopped, bowed his head and stepped into the physical presence of his Savior, the Lord Jesus Christ.